If you drink and smoke you are putting yourself at increased risk for getting pneumonia and other lung infections. 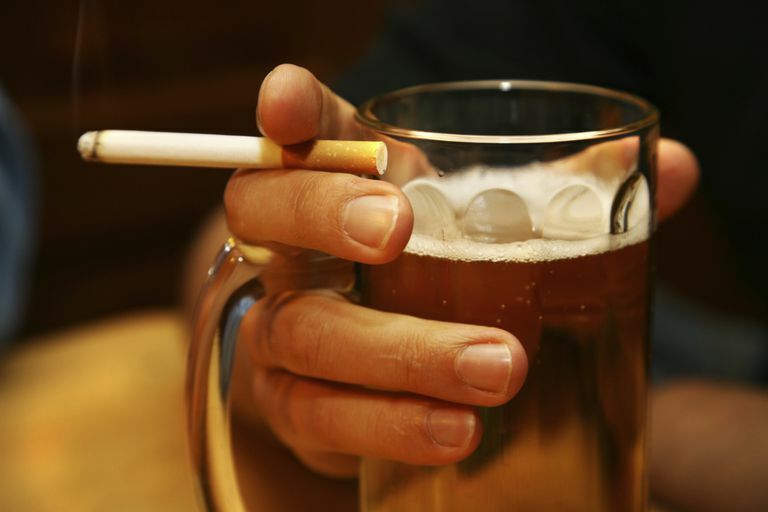 Drinking alcohol makes it easier for bacteria to move into the lungs from the upper part of the nose and smoking cigarettes increases the severity of the bacterial penetration. Therefore, alcoholics who also smoke are a much greater risk of developing infections of the respiratory tract and consequently many other parts of the body. Streptococcus pneumoniae is a bacterium that can infect the upper respiratory tract and cause pneumonia. It can also cause infections in other parts of the body, such as the bloodstream (bacteremia), lining of the brain and spinal cord (meningitis), bones (osteomyelitis), joints (arthritis), ears (otitis media) and sinuses (sinusitis). Alcoholics and cigarette smokers are particularly susceptible to pulmonary infections caused by S. pneumoniae. Alcohol consumption increases movement of S. pneumoniae toward the lungs and smoke exposure exacerbates the alcohol-induced increase in bacterial penetration. "All of the infections caused by S. pneumoniae start with the bacterium colonizing or binding to cells in the upper part of the nose, which is called the nasopharynx," said Gentry-Nielsen, professor of microbiology and immunology at Creighton University School of Medicine, research microbiologist at the Omaha Veterans Affairs Medical Center. "The trachea that leads from the nasopharynx to the lungs is lined with cells that have hair-like projections called cilia. These cilia beat in an upward direction to sweep mucus and microorganisms like S. pneumoniae upward and prevent their movement into the lungs. Disease normally occurs when the immune system is compromised or the person is colonized with a new or especially virulent strain of S. pneumoniae that is able to evade the action of the cilia and travel from the nasopharynx into the lungs." Gentry-Nielsen said that alcoholics are more susceptible to S. pneumoniae infections for several reasons. "They have a decreased gag reflex and an increased risk of movement of nasopharyngeal and gastric contents into their lungs, especially when they lose consciousness," she said. "Both of these defects provide additional opportunities for S. pneumoniae to enter their lungs. Host defenses within the lungs of alcoholics are also compromised, so they are not well equipped to handle the infection once the organisms reach the lungs." "Cigarette smokers also have an increased susceptibility to pulmonary infections caused by S. pneumoniae. Smokers are much more likely to be colonized with the organism in their mouths and nasopharynx than non-smokers," Gentry-Nielsen said. "Smoking also injures cilia and alters the efficiency of their beating so that bacteria entering the trachea have an increased likelihood of making their way into the lungs," she said. Studies done on rats show that a combination of alcohol and cigarette smoke slows the action of the cilia. Gentry-Nielsen notes that this is likely to make hosts more susceptible to infections caused by microorganisms that colonize their upper respiratory tracts. The pneumococcal polysaccharide vaccine (PPSV) is recommended for many types of people who are at greater risk of infection. This includes smokers and those who abuse alcohol as well as anyone age 65 or older. Grau I, Ardanuy C, Calatayud L, Schulze MH, Liñares J, Pallares R. Smoking and alcohol abuse are the most preventable risk factors for invasive pneumonia and other pneumococcal infections. International Journal of Infectious Diseases. 2014;25:59-64. doi:10.1016/j.ijid.2013.12.013. Pneumonia. American Academy of Family Physicians. Wyatt TA, Sisson JH, Allen-Gipson DS, et al. Co-Exposure to Cigarette Smoke and Alcohol Decreases Airway Epithelial Cell Cilia Beating in a Protein Kinase Cε-Dependent Manner. The American Journal of Pathology. 2012;181(2):431-440. doi:10.1016/j.ajpath.2012.04.022. How Can Alcohol Increase the Spread of HIV? Why Are 'Casual' Smokers at a Greater Risk of Binge Drinking?